In June, 1968, almost a year after buying my first Marvel comic, and about five months after I started picking up the publisher’s books on a regular basis, I finally bought my first comic book featuring the work of the man who was probably the single most important architect of the “House of Ideas” (as they liked to call it back then) — Jack Kirby. 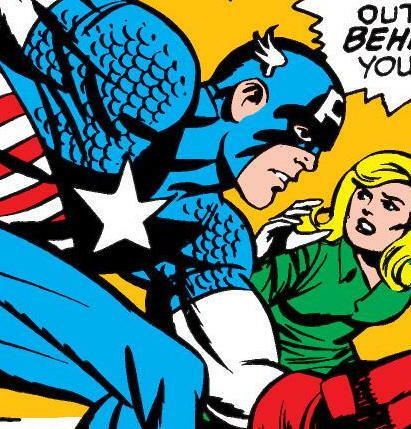 That book was Captain America #105 — the subject of this week’s blog post. Unless, of course, it was Fantastic Four #78 — the subject of next week’s blog post. Allow me to explain that ambiguous statement. The fact is, both of those books came out in the first half of June, 1968 — and as I didn’t necessarily get to the Tote-Sum or one of my other comics outlets every single week back in those days, I can’t just go by which one would have reached stores the earliest. And since I have no specific recollection of which I bought first (and it’s quite possible that I picked them up together, on the same day), I’m going to blog first about the one with the earlier “official” publication date according to the Library of Congress’ records (as reported by Mike’s Amazing World) — and that’s CA #105 (published June 4th) rather than FF #78 (published June 11th). I wish I could be more certain that this one is the first, but this is the best I can do with the information (and poor memory) that I’ve got. Still — to my mind, the more interesting question isn’t which Marvel comic by Jack Kirby I bought first, but rather, why did it take me so long to buy a Marvel comic by Jack Kirby in the first place? I don’t have a definite answer to that question, frankly; but, looking back at everything else I was buying and enjoying a half-century ago, I’m inclined to think that my ten-year-old self thought that Kirby’s work was just too different when I first encountered it. 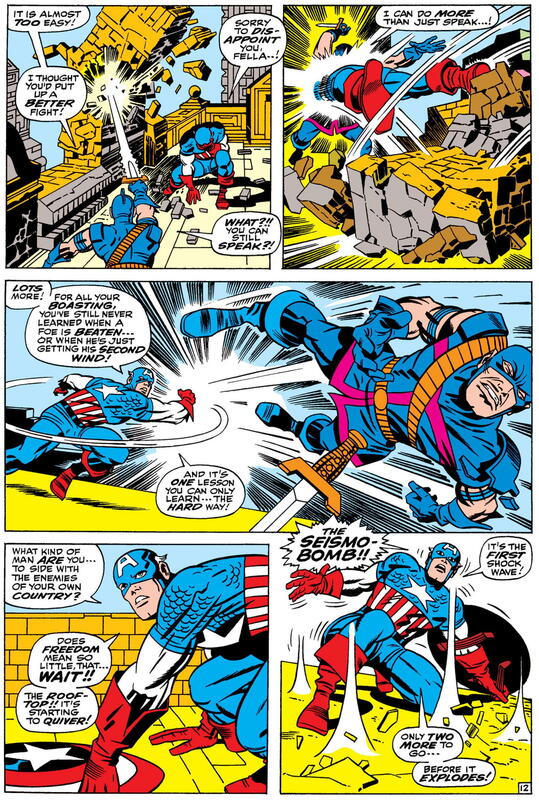 Even in the context of Marvel Comics, where almost every artist was encouraged to emulate Jack Kirby (his approach, at least, if not his literal drawing style), Kirby stood out. In many ways, it was the same situation as one I’ve discussed on several earlier occasions on the blog, regarding my initial coolness to the work of Neal Adams. Obviously, Kirby and Adams were drastically different artists, in terms of style — but both worked in ways that stretched the boundaries of what I’d become accustomed to thinking comic book art was supposed to look like. That idea had been shaped, naturally enough, by the comic books I’d been reading since I started buying them in 1965 — most of which were DC comics drawn by the likes of Carmine Infantino, Gil Kane, and Curt Swan — all very talented artists with distinctive styles of their own, of course, but all also sharing a certain kind of polished, pristine look that seemed to typify DC in that era. The “look” of the first Marvel artists that I encountered — Don Heck, John Romita, Gene Colan — may have been different from that of the DC artists I was accustomed to, but not that different. After all, both Romita and Colan had themselves been working at DC until relatively recently (albeit on romance comics, which I didn’t read). And “Mickey Demeo”, whose inks had embellished every issue of Amazing Spider-Man I’d yet read, was really Mike Esposito, whose work I’d seen at DC on Brave and the Bold, Wonder Woman, and Flash. But Neal Adams and Jack Kirby were very different from virtually everyone else at either DC or Marvel, at least to the eyes of the kid I was in the summer of 1968. Of course, they were each different in their own particular, almost opposite ways; Adams worked at the more representational, photorealistic end of the stylistic spectrum, while no one would be likely to mistake Kirby’s exaggerated, expressionistic figures for real human beings. But both artists exhibited a dynamism, power, and individuality that arrested the attention; they made you look. Neal Adams’ work snuck up on me, basically, as it began appearing in DC titles that I was already buying, such as Detective Comics, The Spectre, and World’s Finest. But I had to choose to buy a Jack Kirby book. And for at least the first five months I was regularly buying Marvel comics, and thus seeing Kirby’s art all over the company’s house ads as well as on the actual covers of books on the stands, I hesitated. 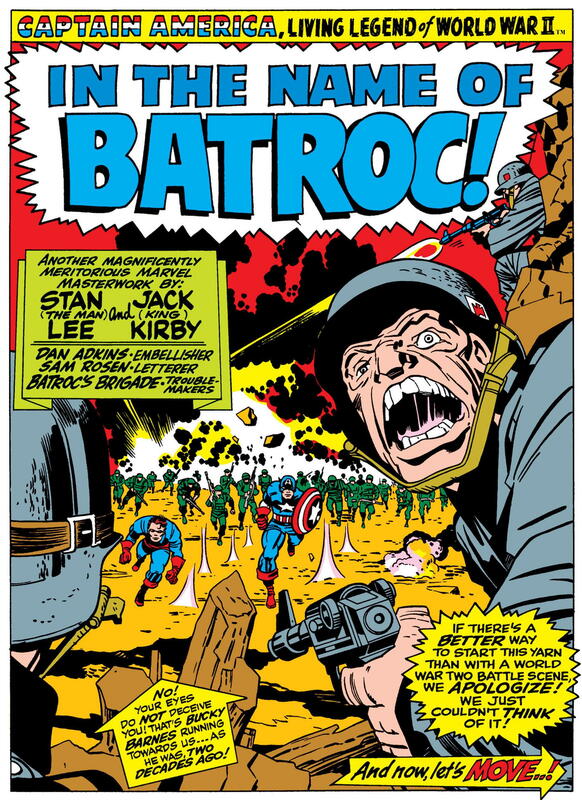 Kirby’s signature “crackle”, his squiggly lines, his blocky figures — maybe just the pure in-your-face power of his art — was still too strange to me, I believe. But by June, 1968, I was finally ready. I knew a little bit about Captain America already, of course. He’d appeared in my very first Marvel comic book, after all — Avengers #45 — where he was the team’s obvious leader, despite not appearing to have any actual super powers of his own. I knew that he’d recently graduated from holding down half of Tales of Suspense to starring in his own title, which had continued his previous home base’s numbering. But I’m not sure I had any idea as yet that the character had debuted way back in 1941, or if I knew anything at all about his back story — how he’d fought in World War II, but had then been frozen in ice for almost two decades before being revived in the present day. Hey, I didn’t think I was buying a war comic, here! And who the heck is “Bucky Barnes”? But writer-editor Stan Lee was right, actually. This scene was a pretty great way to start the issue, especially for a newbie like me. 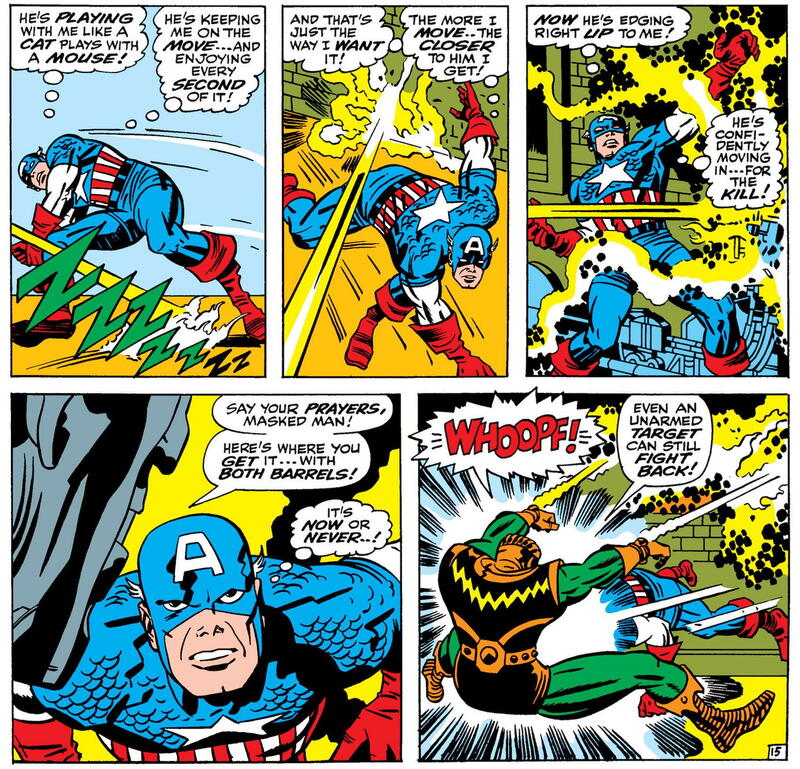 Steve’s anxiety over the possibility of his enemies striking at him through his beloved is a very old trope of the superhero genre, of course — but it has a little more weight in Cap’s case, since the world knows his secret identity. Nonetheless, if my ten-year-old self had had any idea at this point that the aforementioned beloved, Sharon Carter, was herself a secret agent, living a life every bit as dangerous as Steve’s, I might have wondered what all the fuss was about. Gotta find a mission! Need danger! Say, I wonder if there are any costumed super-villains planning to wreak havoc in the Big Apple today? 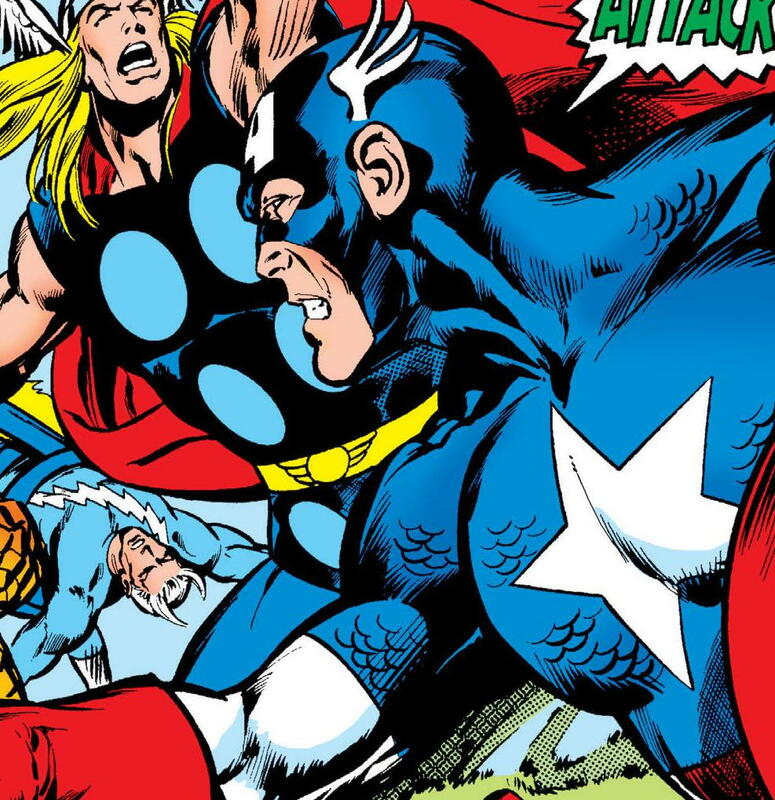 Yep, it looks like Cap is going to hit the jackpot as far as finding danger goes. 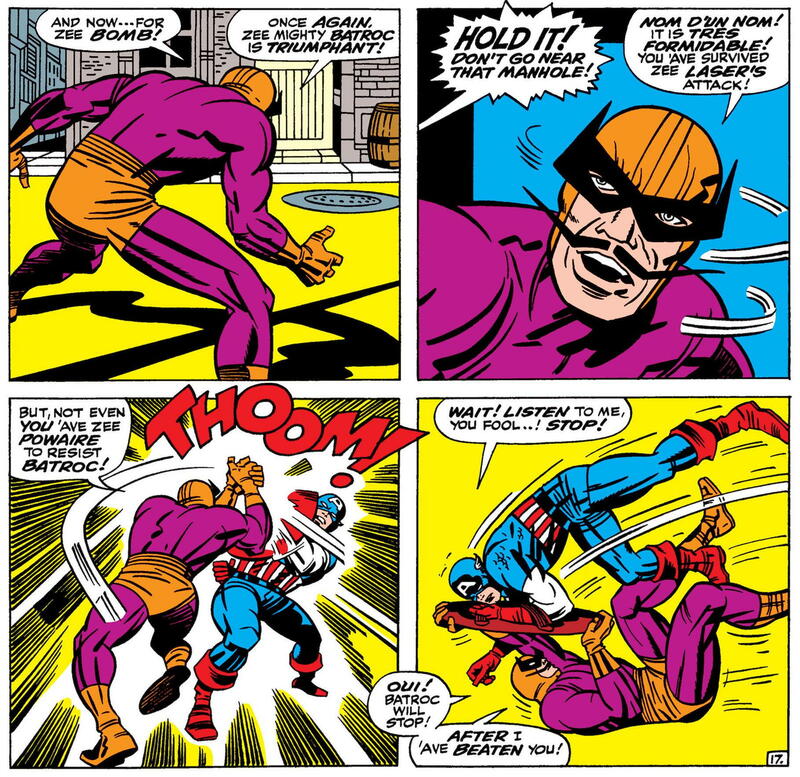 Here we have Batroc the Leaper, a French mercenary and master of savate who first fought our hero in Tales of Suspense #75 (and who also speaks in what must be the most outrageous French dialect to be found in comics). 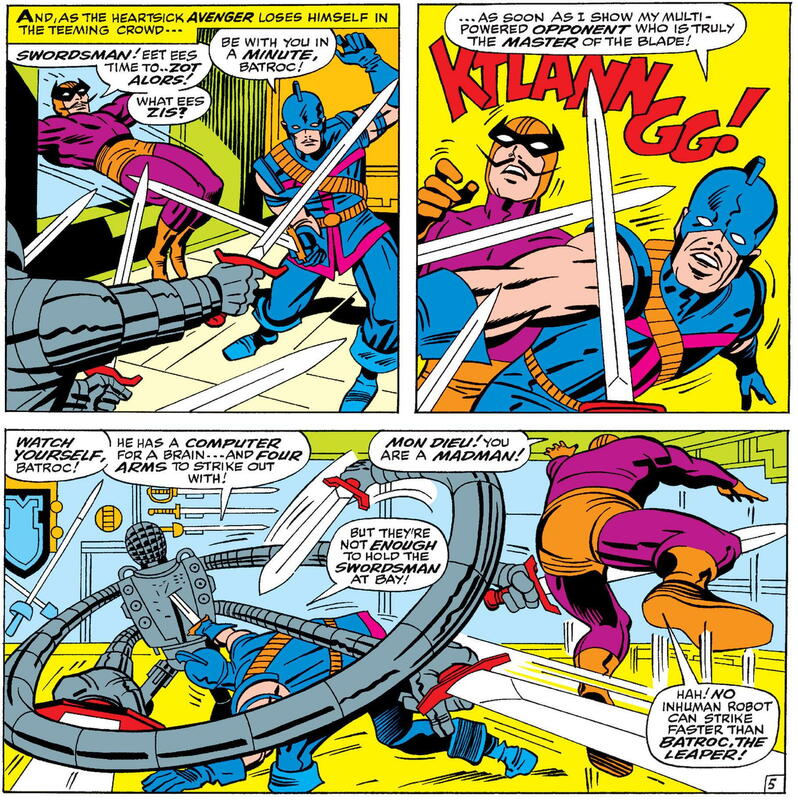 He’s joined by the Swordsman — a somewhat more interesting and morally ambivalent character, first introduced in Avengers #19, who has a shared past with the Avenger Hawkeye — though there’s admittedly not much to his characterization here beyond standard-issue bad guy. 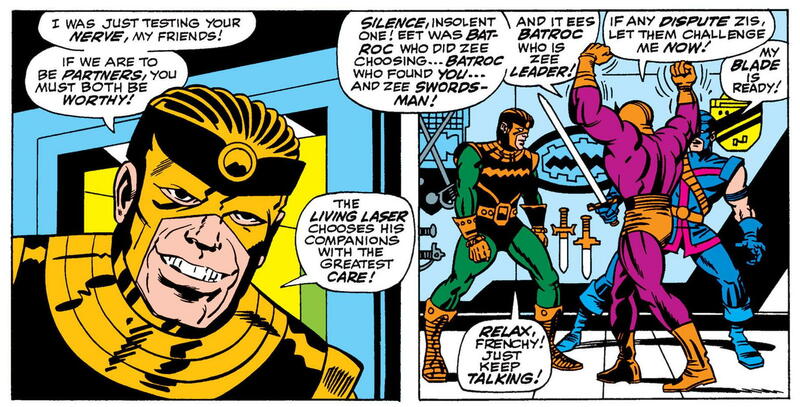 There’s virtually no background information given on any of these guys within the story itself — outside of Batroc, none of them is even given an actual name — but it’s hardly a problem. 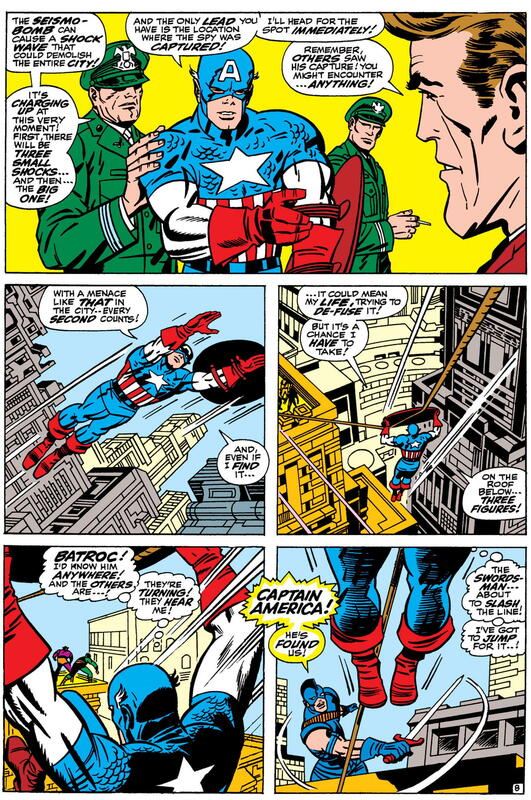 My ten-year-old self understood the necessary basics in 1968 — they’re bad guys, there are three of them, and while they don’t seem to have super powers, their tech and skills would seem to make them formidable foes for Captain America. 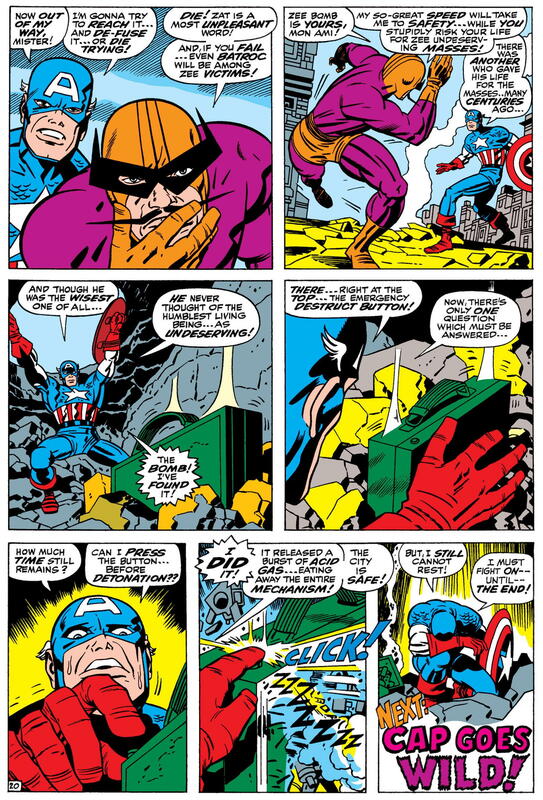 As the scene progresses, Batroc tells his confederates about their first big job — a powerful weapon called a “seismo-bomb” has been hidden somewhere in the city. If they find it before the U.S. military does, they can sell it to a foreign power for a million dollars. The way this page reads, it appears that the spot Cap says he has to get to, the location where the enemy spy was captured, must be right across the street from the building where he’s been having his briefing. I mean, he leaps through the air (out the briefing room’s window? off the building’s roof? ), rides down a handy improvised zip-line, and he’s practically there. 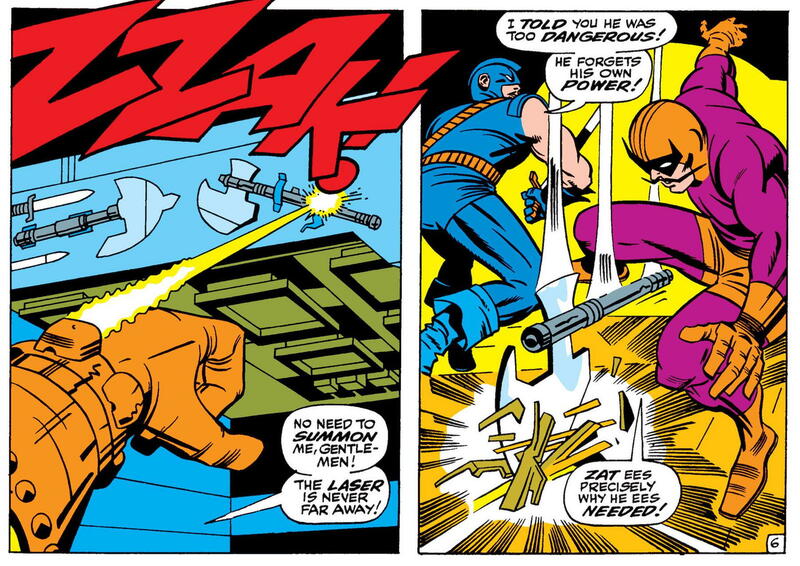 I doubt that this was truly Lee and Kirby’s intention, though. Maybe a caption around the second or third panel indicating the passage of time would have been a good idea? 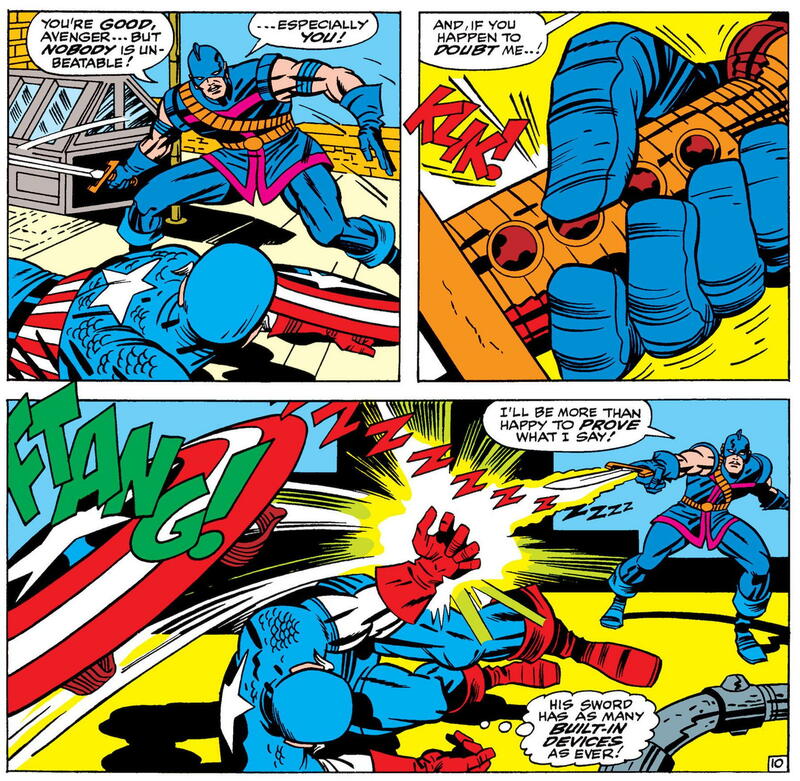 And with that last page, Lee’s script gives us another major piece of what makes Captain America, Captain America — his penchant for speechifyin’ in the heat of battle. 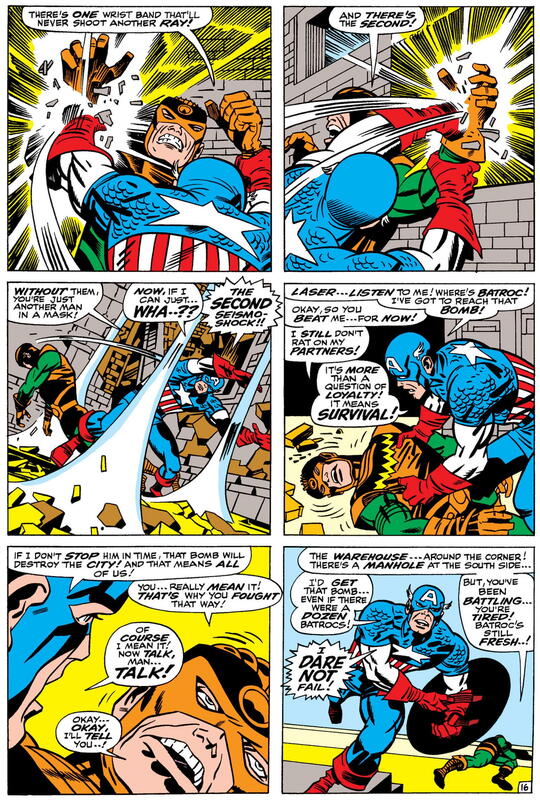 Once again separated from his shield, Cap opts for a rope-a-dope strategy. 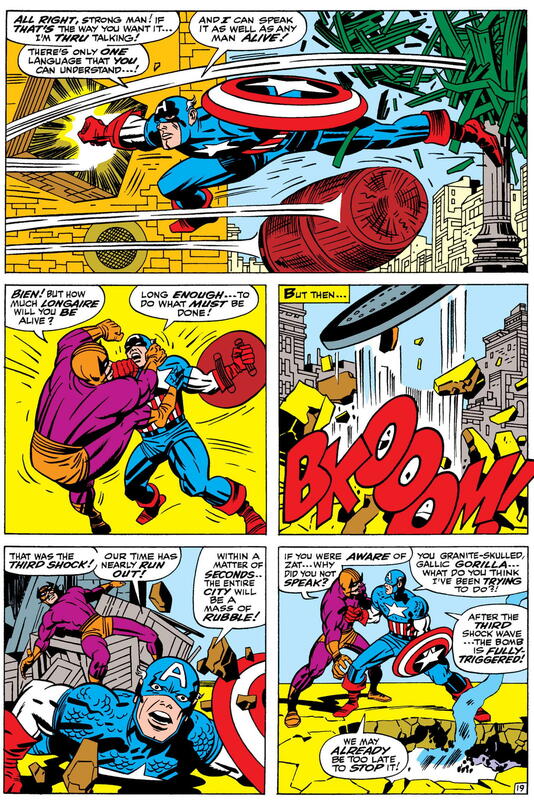 The next panel, featuring Cap leaping towards his foe while simultaneously dodging or knocking away the stuff Batroc’s throwing at him, is classic Jack Kirby — implausible, perhaps, but as thrilling as all get-out. Who needs realism when you can have this? 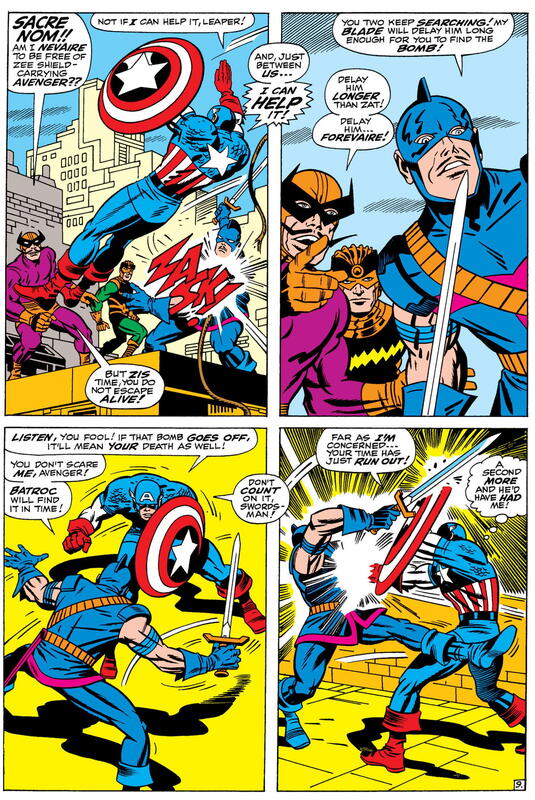 The battle with Batroc is, indeed, over pretty quickly — which makes me wonder if Kirby and Lee realized that Batroc shouldn’t be as big a deal as the laser and energy-ray shooters Cap has already overcome — or if Kirby was just getting just getting short on space as he got near the end of his twenty-page allotment, and needed to wrap things up quickly. 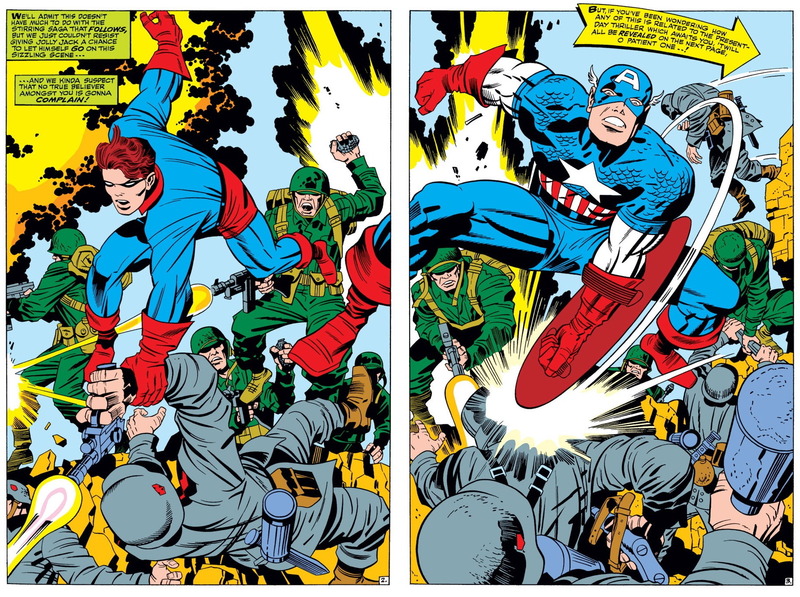 “There was another who gave his life for the masses…” Cap’s allusion to Jesus Christ in the second and third panels impressed the hell out of me (sorry) as a ten-year-old Southern Baptist. I was probably at least mildly surprised when I found out, years later, that Stan Lee was Jewish (culturally, at any rate). But regardless of the writer’s religious affiliation, it’s the sort of lofty sentiment that seems entirely in character for the ever-earnest (did somebody say corny?) Sentinel of Liberty. Captain America #105 wasn’t an especially outstanding issue of the series, I suppose. It could well be described as one long fight scene, and though an entire city is supposed to be in mortal peril, everything gets wrapped up neatly within the story’s twenty pages, with no lasting consequences. 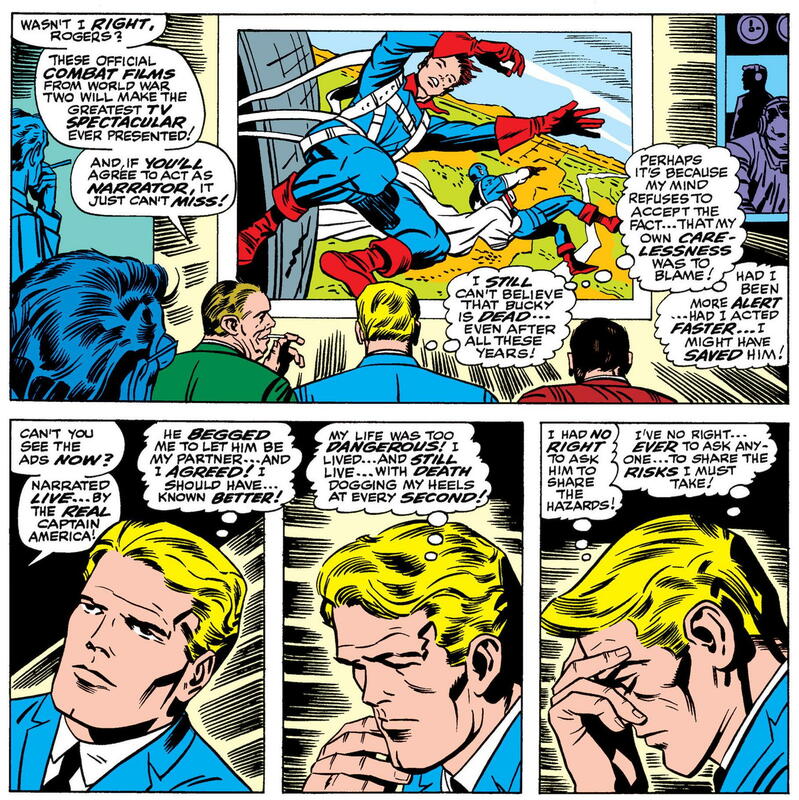 And despite Cap’s moping about, there aren’t even any real developments on the romantic front, or in any other subplot. Someone who regularly read Cap, but somehow failed to buy this month’s issue, might pick up #106 and not even realize he’d missed one. But I think it worked very well as an introduction to the Star-Spangled Avenger for my ten-year-old self, for reasons i’ve already mentioned. It told me about his World War II past, showed me what he could do, and gave me a clear sense of who he was as a person. About the only thing it didn’t do was fill me in on his origin — and, in just four short months, Lee and Kirby would take care of that for me, as well. 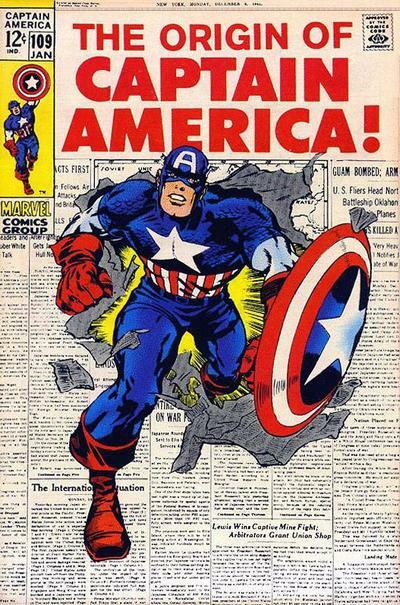 Between that comic and a special Avengers issue that I’d be picking up in July, I’d end up closing out 1968 with a pretty decent grounding in Captain America lore. But that’s a post for next month. Hope to see you then, true believer! After I shared this post on Facebook, I was tipped off to this great piece on the Jack Kirby Museum web site, which details the very complicated (and still somewhat mysterious) genesis of CA #105’s cover — a story which involves several prominent comic book artists in addition to Jack Kirby. Many thanks to Steve Newton for sharing this info! There are a lot of comic book fans, myself included, who when we first saw Jack Kirby’s artwork thought it looked weird. Of course we all, sooner or later, came to appreciate what an incredible artist he really was. Glad you had a link to the story of the cover changes for this issue. The composition is a bit off, but as a kid it never bothered me at all.